“Write what you know” is good advice to writers, but sometimes “write what fascinates you” makes a more interesting, though longer journey. Circle of Cranes was inspired by real life events. A series of migrant ships were intercepted off the coast of the Queen Charlotte Islands in British Columbia in the summer of 1999. 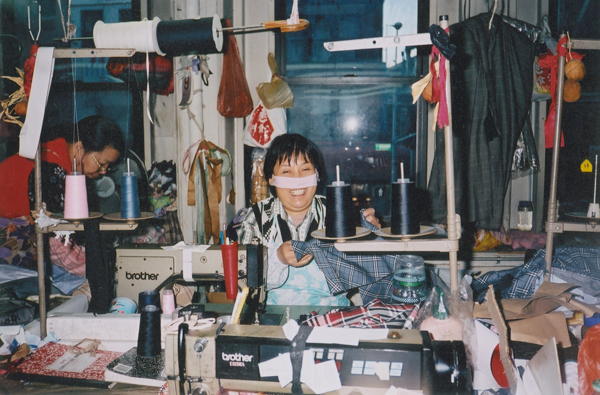 The migrant ships were headed to New York City’s Chinatown where the girls would work in sweatshops stitching clothes and the boys in restaurants. Children as young as seven were on board, some of them without their families. Through a mutual friend, I was able to interview an immigration officer who had boarded one of these ships and described the horrific conditions in the hold. The officer vetted my manuscript to ensure accuracy. 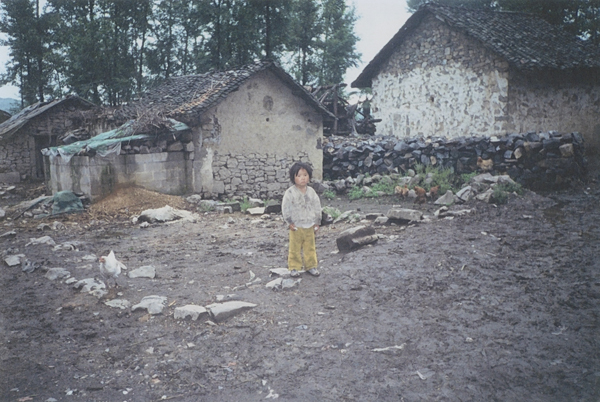 In 2000, I travelled to Cao Hai, an impoverished village in the mountains of Guizhou province, to research my novel. 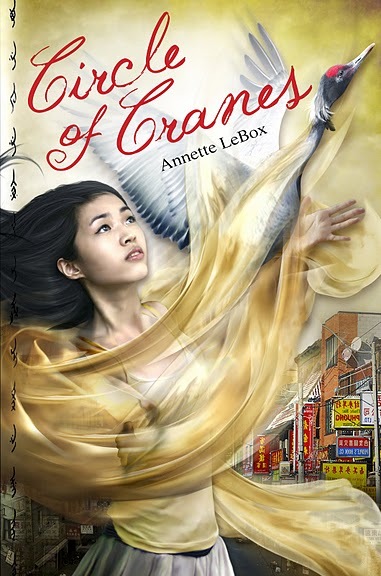 Cao Hai is known for the flock of black-necked cranes that winter on the lake, so it seemed an apt birthplace for my main character, Suyin, who belongs to an ancient Crane Sisterhood. Suyin also belongs to the ethnic Miao minority people. Miao women define themselves by the skill of their embroidery. As I couldn’t speak the language, I carried a Chinese-English dictionary and a set of small flashcards with place names in English and Mandarin. Despite the language barrier, the people of rural China went out of their way to help me. I found that the poorest families were the most generous. In Weining, I met an English-speaking cadre, Ming Jun, who took me to visit Cao Hai Village and acted as my interpreter. 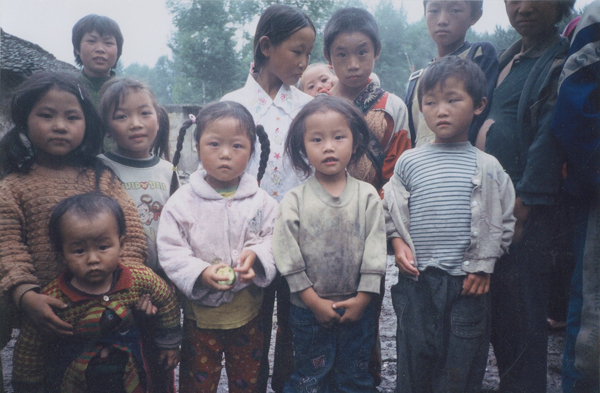 The children in Cao Hai had no shoes or books or toys. There was no electricity in the village at that time. Most of the girls couldn’t afford to go to school. If the family managed to pay the yearly tuition fee, a son, not a daughter would be sent. The lack of education for girls became one of the themes of my novel. To find out more about cranes and their habitat, log onto the International Crane Foundation at www.savingcranes.org. When I left Cao Hai, Ming Jun arranged for his sister, Ming Xia (or Rose, her English name) to act as my interpreter and in exchange, I would help Rose with her English. 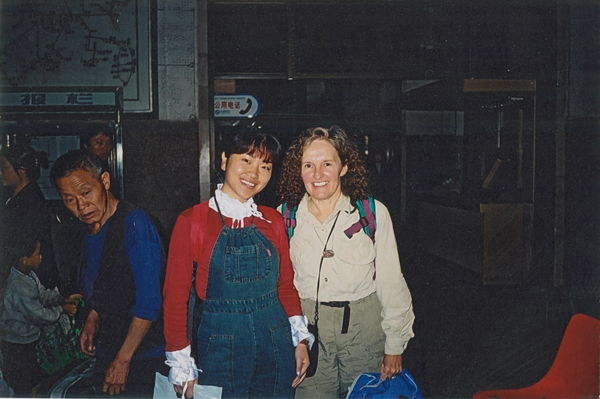 Rose and I at the Luipangshui Train Station the first day we met. Rose and I had many adventures together. We travelled to the mountain villages near Kaeli while I researched the Miao minority people and their embroidery techniques. 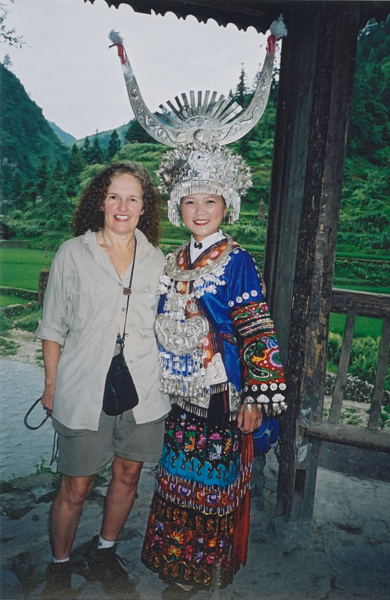 To listen to a Podcast of my adventures with Rose called my Chinese Daughter, log onto CBC’s Living Outloud, Mothers and Daughters Part 2. Note: Part 2 of this episode is a story of a mother and daughter who travel to Cambodia to find out what happened to a relative who disappeared during the murderous rule of Pol Pot. The second story is My Chinese Daughter. The Miao stitch their history on their clothing. In the photo, the young girl is dressed in her festival clothes. Note her lovely silver crown. Suyin, the heroine of Circle of Cranes, belongs to the Miao people in China. 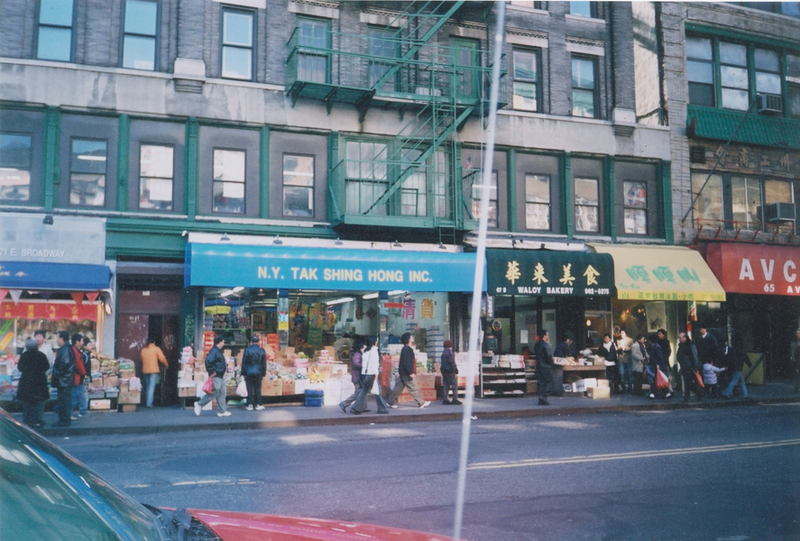 An expert in illegal Chinese labour in New York City pointed out the locations of several sweatshops in Chinatown and I managed to talk my way inside one of the shops on the upper floor of a tenement on East Broadway. 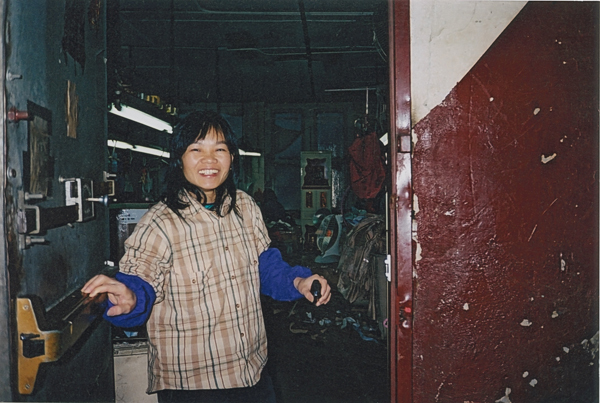 This shop became the setting in which Suyin, the main character of my novel ,works for pennies as a thread cutter. As the garment workers I met couldn’t speak English, I communicated with them by using hand gestures and by drawing pictures. Many garment workers wear masks to protect them from the chemicals clinging to the fibres of the fabric they’re stitching. The second shop I entered was unlocked, so I walked inside and began snapping photographs. This angered the factory boss who chased me downstairs and into the street.